Back when I was 9-to-5ing it, I worked for a jewelry company. The owner’s marketing strategy was: Hand out the latest Tiffany catalog, forward the latest Tiffany email, and pin up the latest Tiffany promotional postcard. This is Tiffany’s packaging. This is how Tiffany organizes their website. This is how Tiffany’s photography looks. The thing was: He wasn’t competing with Tiffany, and he failed to see how limited he had become by trying to imitate their very distinctive (and very well-protected) brand image. 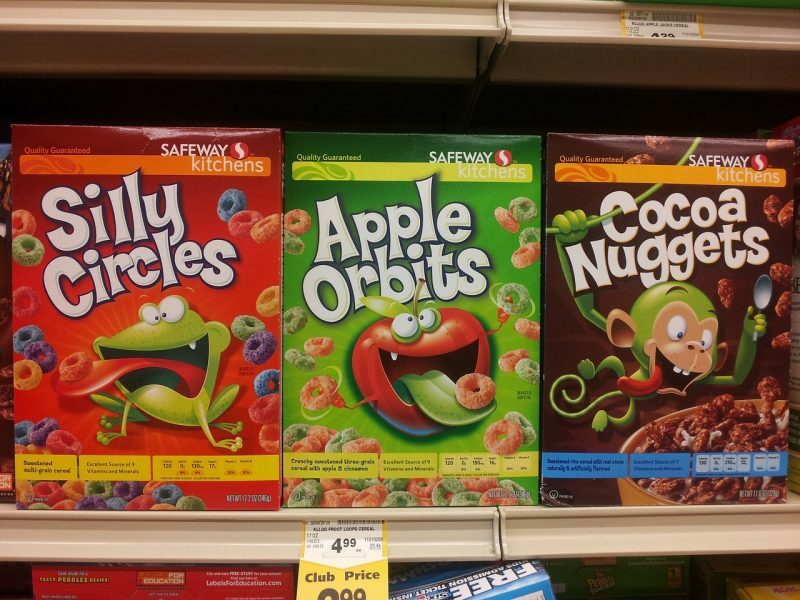 I always wondered: Why would anyone want to build a knock-off brand? Let’s say you’ve built a restaurant that serves some of the best pizza in town, at least according to your Seamless reviews. You’ve been a mainstay in the neighborhood for five years. Delivery and takeout are fairly steady, but dine-in sales have steadily diminished, and you’re lacking the exposure you need to scale. Some months you’re struggling to pay the staff. A few blocks away, a new place opens. You hear from neighbors that it’s hopping. You walk by to check it out and, sure enough, it’s a full house. On the surface, that’s true—sort of. Business owners can be fooled into thinking a brand reboot is simply about visuals. But visuals are only the surface change that needs to happen. It’s far more complex than that. 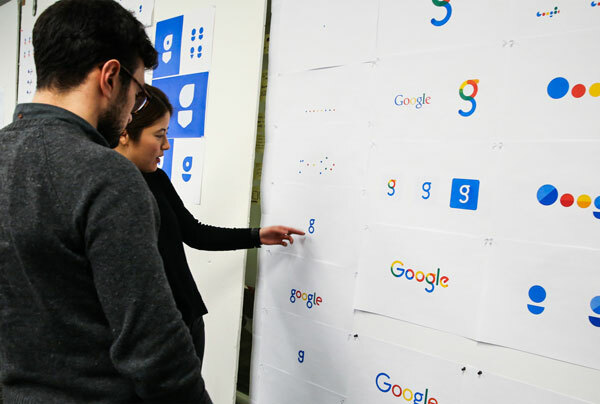 Why did Google reinvent their brand identity? They had endless brand recognition. Was it really necessary? Google is not a conventional company. Our mission—to organize the world’s information and make it universally accessible and useful—continues to evolve…. With those considerations in mind, we are excited to share a new brand identity that aims to make Google more accessible and useful to our users—wherever they may encounter it. Design was only one part of the effort. The realization of the new identity required the collective work and diligence of hundreds of Googlers, in different roles, spanning the entire organization. If all you can say about your brand story is, “We sell great ____ and we’ve been doing it longer than some other people,” you’re in for serious struggle. If you don’t think your brand is important to your customers, then you have a LOT of work to do—to change your attitude and understanding of the importance of brand to today’s consumer in ALL industries, as well as to get cracking on defining who you are as a brand. And that includes asking your customers what they think. 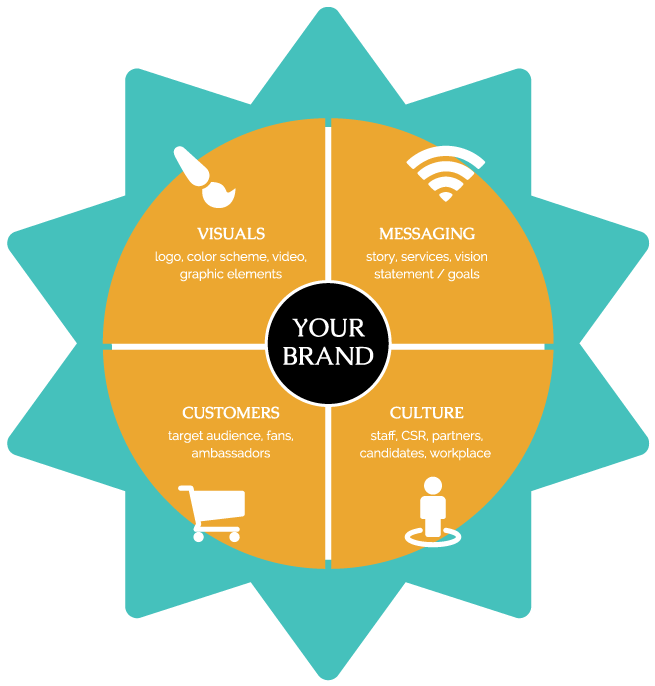 Making decisions that simultaneously take into account each of these areas shows your customers (and staff) that your brand stands for something—that it commands the market as a leader rather than a cheap rip-off. Another common mistake made by businesses is to lower their prices to compete. In one fell swoop, they’ve diminished the overall value of their products, services, and story. SEE ALSO: Why do you need a customer loyalty program? As many marketing experts will tell you, once a company is forced to compete on price alone, they’ve lost the battle. 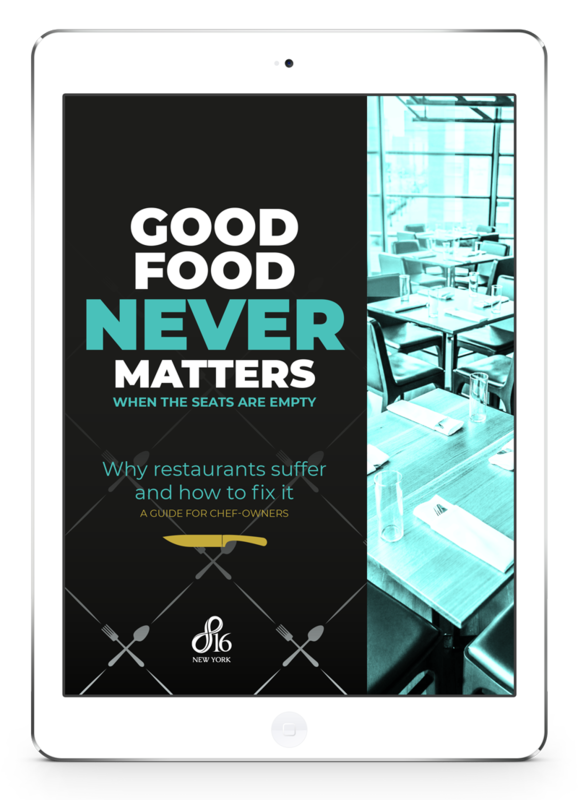 If a customer suddenly likes the neighbor’s restaurant more, then what about your brand is going to make them switch? Your customers are now trained (mostly by marketing people like us) to make purchase decisions based on the overall impression they get from your brand. Price might work short-term—but only short-term. In fact, it’s generally the case that as your brand becomes more authentic, it becomes more sought-after, allowing you to actually RAISE your prices. Let’s say the new restaurant offers interesting incentives to their customers or has an in-house jazz band on Friday nights. They send out regular email coupons and run engaging contests on social media. When someone shoots off a complaint on Yelp, rather than ignoring them out of irritation, the manager personally and quickly responds with a heartfelt note. Their delivery guy is always friendly and prompt—always. 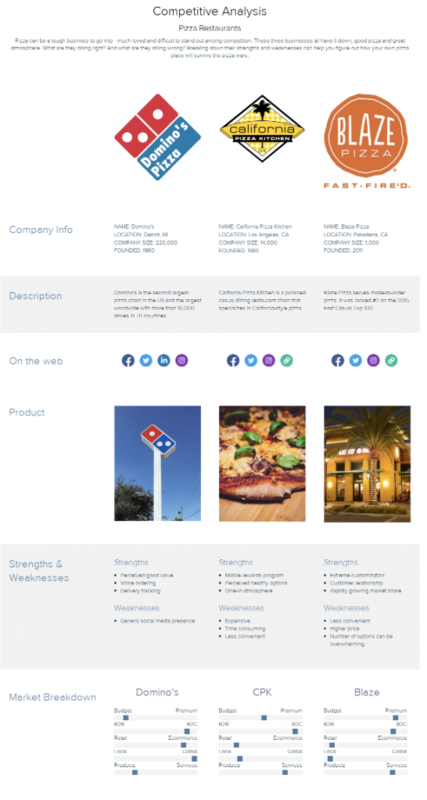 It’s not just about the visual style of the location, menus, and logo. It’s about the experience of the brand as a whole. And you can’t imitate that. So those are the facts. Now what? Xtensio’s competitive analysis tool offers you an online and brand strength snapshot of your biggest competitors. Have you used it? Study companies whose annual revenue, marketing budget, product line, and company size are likely to be about the same as yours. Xtensio offers a nifty online tool, or you can go old-school and follow the Entrepreneur.com guide, doing it on paper or in Excel. All the numeric data and fancy graphics in the world can’t compete with the impact of your story on your customers. It’s the reason Steve Jobs sold millions of iPods by skipping the technical specifications and simply stating that one thousand songs could now fit in your pocket. It’s the reason trial lawyers appeal to a jury’s humanity as much as the letter of the law. It’s the reason political candidates fight to define each other’s narrative. When human beings need to persuade people about ideas, we tell stories. What’s probably most valuable in competitive analysis is what your competitors are not showing or telling you. Perhaps there is just one element of their business that really sets them apart but that can’t be found on their website or in their literature. For instance, you don’t know how much each customer is costing them. Digital marketing, advertising, and coupons aren’t cheap. You can make truly reliable decisions about your brand if you consider the weaknesses of your competitors rather than what you perceive they’re doing better. How do you solve the customers’ problems better? How have you solved similar problems in the past and how did people respond? How can you relate to your consumer on their level by being personal? Can you offer case studies or use social media Stories to share with your community? What is the amount you’re willing to spend on coupons, online ads, and the like? Use a little creativity to push a good idea a step further. Do it better. Stand apart from your competitors, not alongside them. As the co-owner of a small business, I agree that it is crucial to really connect with the people we are serving. Letting them know who we really are and why our service is better than some others comes from our past history and also the way we interact with customers each and every day. I can’t waste time worrying about the competition. I focus on taking the best care I can of my clients and that includes keeping them well-informed in ways that fit into their lifestyle. Thanks for checking out the post, Sue! I’m glad you’ve recognized the importance of putting your competition in perspective. While it’s certainly important to keep tabs, it’s most important to show consumers why they don’t need to look elsewhere.